When you’re an upstart entrepreneur prowling for a new (or next) business idea, the sheer number of opportunities can be overwhelming. Do you opt for a dropshipping opportunity? Or add your unique brand to already-existing merchandise? Here's a quick answer for a new business: Learn how to make bath bombs. Or perhaps you’re an avid DIYer with an aptitude for crafts. While jumping from one Pinterest project to another may scratch that creative itch, you can actually turn your artistic pursuits into a viable business using your craft skills. The beauty biz is a niche worth considering for your next product idea. According to a report from Statista, the cosmetics industry is projected to have made $62.46 billion in revenue in 2016. That’s enough cash to turn the heads of most aspiring entrepreneurs. Have dollars signs flashing before your eyes? Ambitious would-be merchants can get a slice of this growing market by learning how to make bath bombs and leveraging those skills to sell these popular beauty products. Yes, those delightfully foamy treats that bubble and dissolve while you bathe. Before you outright dismiss the idea of such a product actually turning a profit, consider this: Not only are these beauty products popular with consumers, they’re also simple to make in your own kitchen. No heavy equipment or expensive materials are required. 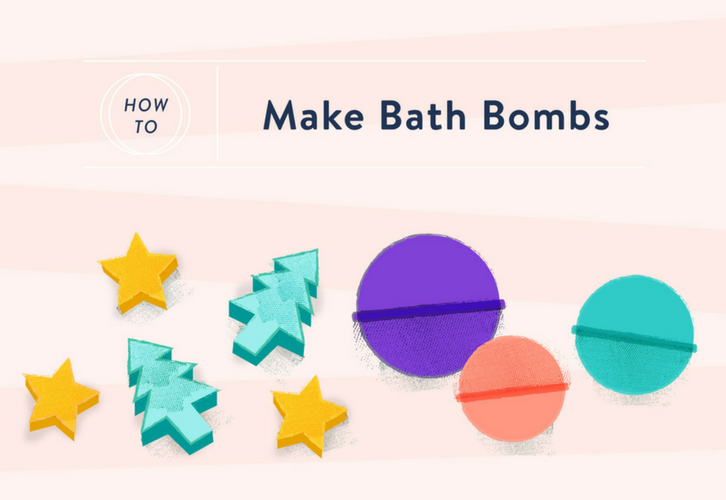 Here, we’ll guide you through the process of how to make bath bombs, and build these products into an income stream. We’ll guide you through sourcing your ingredients, creating your products, and prepping them to sell so that you can build a viable bath bomb business. So, let’s get started with a deeper examination of the bath bomb business as a whole and how to make bath bombs yourself. WANT THE FULL INFOGRAPHIC? 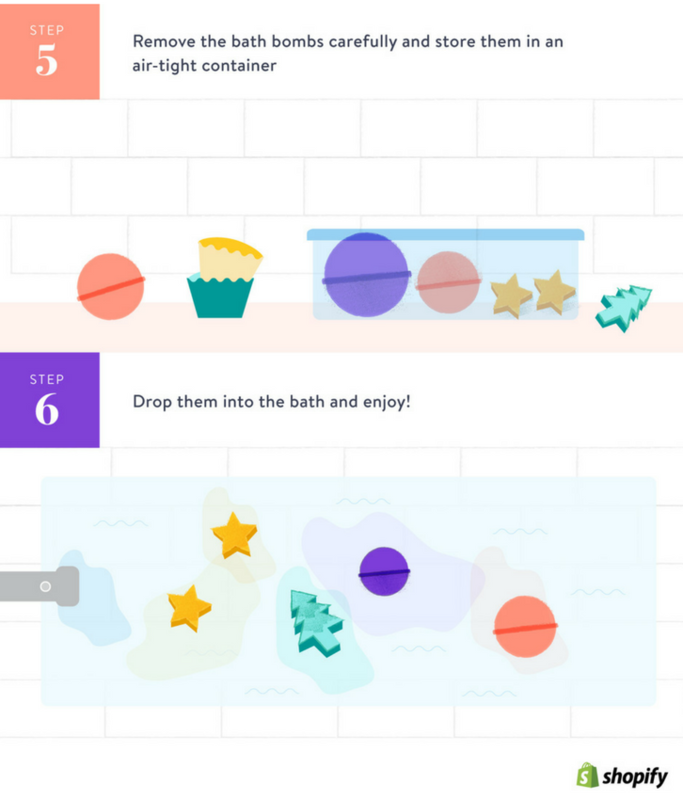 This article features an infographic with a basic bath bomb recipe. Download the full infographic here. Building a bath bomb business comes with a variety of benefits. As aforementioned, you can create your own line of products in your kitchen with just a few inexpensive ingredients. Overhead costs are low. Depending on what ingredients you already have tucked around your house, the startup costs for this kind of business are minimal. You can sell bath bombs both online and offline at markets and fairs. Anyone can learn how to make bath bombs. As you’ll see from our recipe below, bath bombs are easy to make. Because bath bombs are small and compact, it’s easy to store additional inventory. Easy to customize: We’ll introduce you to a simple bath bomb recipe below that serves as a guideline for creating your own, but you can switch out interesting or unusual ingredients to differentiate your products. Bath bombs are growing in popularity. As we’ve already pointed out, the beauty business is booming. But bath bombs in particular have gained traction as a worldwide trend in the last few years — and it doesn’t look like their popularity will be slowing down anytime soon. In addition to shopping for these bath products for themselves, customers also purchase them in increasing increments as gifts around the holidays. As you can view in the graph above, the sharp spikes in sales happen around the holidays each year, showing that bath bombs are popular Christmas and holiday gifts. Now that you know this beauty trend has some decent traction, let’s examine some of the most popular types of bath bombs that you can consider when mulling over the specifics of your business (and learning how to make bath bombs yourself). Most of us (even if you aren’t a cosmetics junkie) are familiar with a basic bath bomb. These products are traditionally spherical shaped and come in a variety of colors and scents. And once you drop them in your bath water, they fizz and create soothing bubbles. Many are also infused with essential oils and other ingredients to make your bath even more relaxing. From lavender to sweet citrus scents, bath bombs offer a smorgasbord of smells to help you unwind and infuse your skin with moisture. Some brands prefer to add little extras to their bath products in the form of sparkly jewels. Popular brands like Charmed Aroma and Fragrant Jewels have not only created lines of sweet-smelling bathtime treats — their customers also receive semi-precious jewelry inside their bath bombs. These jewel bath bombs range in scents and the type of jewelry they offer, but this version of bath bombs is one of the most popular, especially as a gift. For those shoppers who love baths that are equally as shiny as they are relaxing, they can indulge in a variety of glitter bath bomb. The luxurious addition of a little glitter, confetti, or other sparkles into these products has caught the eye of consumers — more major bath brands like Lush are making multiple variations of these beautiful bombs. Other beauty merchants have chosen to think outside the box — or ball, in this case. Retailers are creating bath bombs in unusual and interesting shapes, like the cupcake bath bomb above from Feeling Smitten Bath Bakery. Bath bomb creators have built products in a variety of shapes and sizes to meet the varying needs of their customers. Whether these customized bath products are intended as favors for a bridal or baby shower, an ideal gift for a pastry lover, or perfect for bathtime for your kiddos, there’s likely a themed product out there to meet shoppers’ demands. And from hearts to donuts to chill pills to Pokeballs, the only limit on the shape of your bath bomb is your imagination. Once you’ve settled on what type of bath bombs you’ll make, it’s time to get started on how to make bath bombs — whether you choose a basic product or your own unique creation. Merchants may already have some or all of these items sitting around your home. For any missing ingredients, you can also source all these items from your local grocery or craft store. You’ll also require molds to shape your bath products. While you can certainly stick with the traditionally sphere shape, you can also purchase molds in a variety of shapes, sizes, and designs. If you prefer shapes that are more unique, you can opt to purchase silicone molds that are usually used for baking (or for freezing ice into specific shapes). Silicone molds offer aspiring beauty entrepreneurs more choices, hold up well during the creation process, are easily cleaned, and silicone trays help you create multiple products in one batch. Best of all, most silicone molds are priced at $5 or under per piece. NOTE: Because bath bombs are crumbly in texture, molds with intricate designs and small pieces could break off. Testing and experimentation will help you decipher the best molds to use to achieve your desired results. 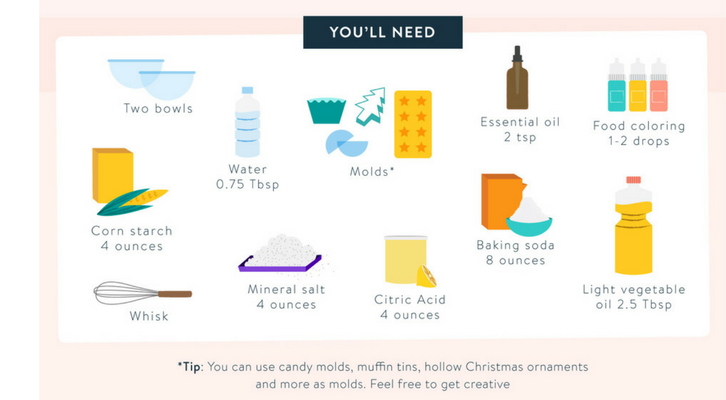 Now that you’ve gathered all the necessary ingredients and supplies, you can mix up your bath bombs. Essentially, you just need to combine the wet and dry ingredients in separate bowls. Then you can slowly combine the two mixtures into a single bowl. 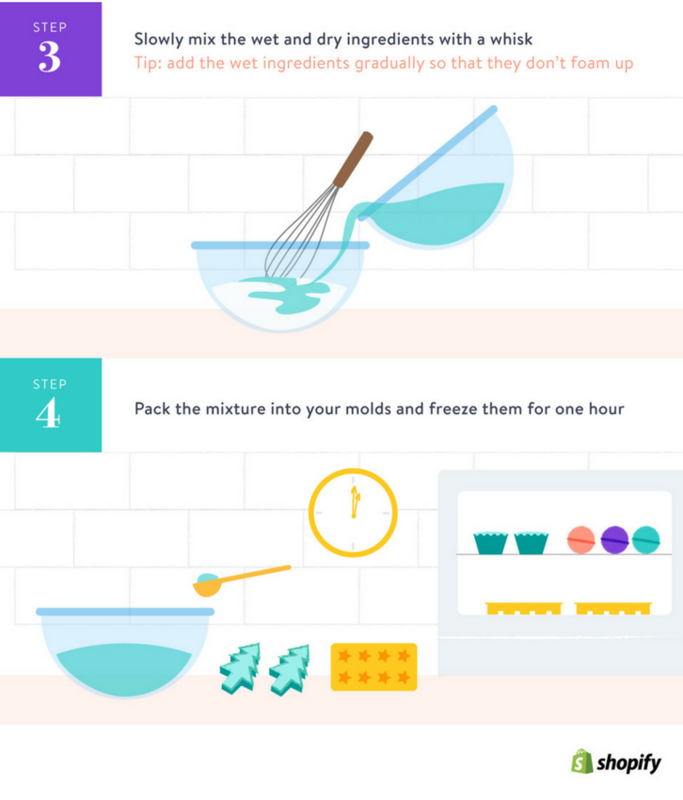 Once your ingredients are combined, simply pack the mixture into your favorite mold and place it into your freezer for an hour. Ensure the molds are tightly packed and fully filled with the mixture to keep your bath bombs dense. After freezing, remove the bath bombs from the molds and ta da! You’ve successfully created your first batch of bath bombs. If you don’t plan to use them (or sell them) right away, store them in airtight containers like plastic or glass Tupperware. Fresher bombs fizz and bubble more when dropped in a bath, so proper storage is integral to keep your inventory at its highest level of quality. Now that you’ve perfected your recipe and made your bath bombs, it’s time to start selling. Amazon and Etsy are solid marketplace options to list your bath products, and you can also use an ecommerce tool like Shopify to build your own online store for a long-term business. Instagram: Build a large following of brand evangelists, provide demos of your products, and create beautiful visuals that engage your audience. Facebook Live: While social media has always offered users the chance to become more engaged with the brands and celebrities they love — and become more loyal to them as a result — Facebook Live now makes it possible for fans to stop whatever they’re doing and experience engagement with their favorite brands on a whole new level. Pinterest: More businesses are taking advantage of Pinterest to plant visual seeds, allowing new customers to find retailers on the platform. Snapchat: The app has a user base of more than 200 million, and is especially popular among millennials, a demographic that marketers hope to better understand and influence. According to the platform, Snapchat reaches 41% of all 18-to-34-year-olds in the U.S. on any given day — a group that has around $200 billion in annual buying power. Giveaways and Contests: Everyone likes free stuff. But giveaways aren’t just great for the winner — they’re an opportunity for you to grow your retail business. With a little bit of product as a prize and some marketing effort, an online giveaway can help your business. Email Marketing: Deliver deals, promos, and news directly to your target audiences' inboxes — and make sales in the process. While these aren’t the only channels you can use to reach your target audience, these are a few mediums that can help you get started and build a loyal following online. Burgeoning beauty merchants don’t need to limit themselves to simply selling online — many makers also successfully sell IRL (in real life, of course). Selling in person allows merchants to access a new audience and receive live feedback on their products. Market booths and pop-up shops allow small businesses the opportunity to have a temporary retail location without financially committing to high storefront rents and long leases on space. And selling alongside other talented crafters and DIY masters can serve up some serious inspiration for future products as well. Get a live product testing ground: You’ll hear direct feedback and questions from your customers. Addressing their concerns live gives merchants invaluable insights on how to improve products or answer customer pain points. Introduce yourself to potential wholesale clients: Other retailers attend markets and fairs on the prowl for new products for their stores. This is an ideal opportunity for smaller beauty merchants to connect for wholesale deals. Build an email subscriber list and/or social following from connections you meet at the fair, market, or festival. Connect with fellow entrepreneurs, makers, and business owners. It’s never a bad idea to build your network. While selling offline may sound a bit intimidating, it’s simple enough to take transactions while on the go. Using a mobile point-of-sale system like Shopify POS, you can set up shop and hawk your freshly made wares at flea and farmer’s market, craft fairs, and/or maker fairs. If you’re keen to sell your products in the real world, read our guide to nailing the in-person selling experience. Ready to Start Your Own Bath Bomb Business? Now that you have a viable business idea and have some guidance on how to execute on it, you can work toward building a long-term, sustainable income. So, now it’s time to get out there and get selling! 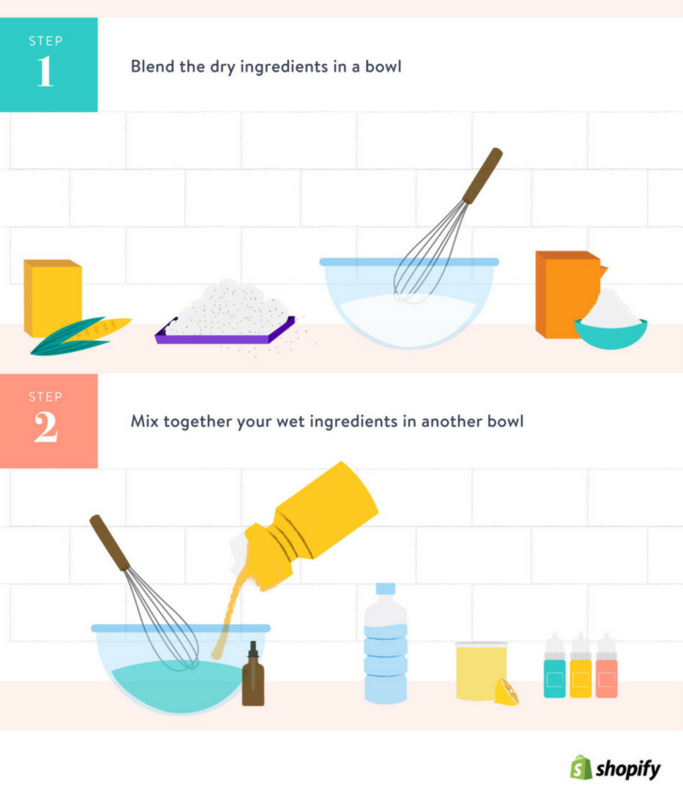 Now that you've learned how to make bath bombs in your own kitchen, it's time to get started! Have you tried making your own bath bomb business? Have any tips for the rest of us? Share your advice in the comments below.